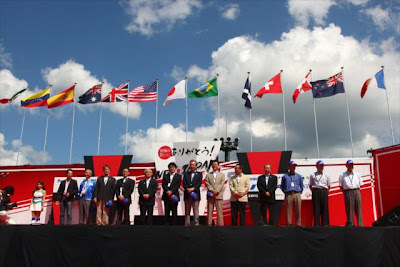 The only time the IZOD INDYCAR Series competes on the west side of the Pacific Ocean, the Japanese round at the Twin Ring Motegi circuit was created The last scheduled race for the IZOD INDYCAR Series in Japan almost did not happen as a result of the tragic aftermath resulting from the Earthquake and Tsunami in March. Planned to run on the 1.549 mile oval, the event was at risk when there was damage found to the Twin Ring Motegi oval. There was also debate of whether or not the event in Japan should have been held this year. Devastation caused by the natural disaster is continuing to leave lingering troubles for the Japanese population. Some believed a major sporting event even 6 months after the disaster for the country was too soon. However, determined to keep the commitment to their economy, INDYCAR and race fans, the event has been relocated to the connected Motegi road course. 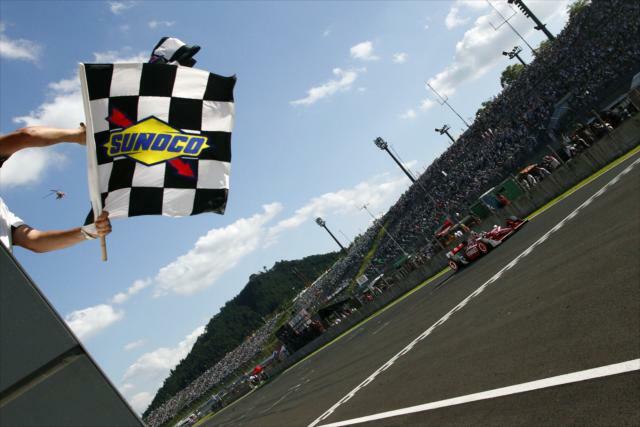 Titled Indy Japan: The Final, the 26-car field arrived on the 2.98 mile road course. In Saturday qualifying, Scott Dixon took pole with a 1-minute, 38.3918-second top lap time in the Firestone Fast Six session. Will Power started along Dixon gaining a large possible advantage in his points fight with Dario Franchitti. As the Japanese race switched from the oval to the road course, it would be at least an equalizer for the #12 Penske Racing driver fight for the title. At the start of the 63-lap event, Will Power challenged Scott Dixon hard almost getting squeezed by the #9 car in the race's second turn. Drama early at the start resulted as Helio Castroneves drove into the turn 1 sand trap in avoidance of a rear-end collision with Ryan Briscoe. Castroneves' returned to the track quickly but fell well back in the running order after a 6th place start. As Dixon and Power maintained a common pace at the front, teams immediately planned their pit stop strategy. Part time driver Hideki Mutoh and KV Racing Technology #82 car of Tony Kanaan pitted early for fuel as well as a change of tires. On lap 22, both Will Power and leader Scott Dixon pitted with the #9 Target Chip Ganassi Racing car just barely beating the Penske Racing #12 car. Ahead of the race, teams and drivers of the IZOD INDYCAR Series were concerned about the lack of grip on the Motegi road course circuit. With drivers such as James Hinchcliffe sliding on track during practice, competitors with limited INDYCAR race involvement spent time off track. The #22 of Giorgio Pantano went off track several time during the event while the #34 car Joao Paulo de Oliveira collided with the #5 car of Takuma Sato. A few laps later, the #34 Conquest Racing car piloted by de Oliveira came to a stop drawing the first full course caution at the Motegi road course. On the restart on lap 26, Dario Franchitti went three-wide on Ryan Briscoe and Graham Rahal into turn 1. Turning the Penske Racing #6 around on track, Franchitti's #10 car and Chip Ganassi #38 car of Rahal were trapped behind the stationary Briscoe. Charlie Kimball (another Chip Ganassi owned car also took evasive action through the sand as the incident drew a second race caution. All three car were able to resume racing but Dario Franchitti was assessed a penalty for avoidable contact. Sent to the back of the field on the restart, team owner Chip Ganassi expressed some firm disappointment for his Scottish driver. Franchitti would drive through the event and rallied to an 8th place finish. Another race where Graham Rahal was kept in a wreck after running strong, he brought the #38 car home 12th. The only Chip Ganassi Racing car not involved in the lap 26 mayhem, the #9 car driven by New Zealand's Scott Dixon put on a very impressive show of force. Pulling Will Power at bay, Dixon ran comfortably translating his the pole position speed into a solid race pace. With 6 laps remaining, the #28 car of Ryan Hunter-Reay made contact with the #19 of Sebastien Bourdais sending the Andretti Autosport racing machine into the sand trap. Once Hunter-Reay was recovered from the sand, the race resumed with only 3 laps to go. After a false double-file restart one lap earlier, Will Power was provided with one last opportunity to challenge the dominant Scott Dixon for the Indy Japan win. Dixon launched perfectly on lap 62 leaving the Penske Racing driver in his dust. In third, Marco Andretti and Oriol Servia dueled for the final podium spot with the Newman/Haas Racing race car briefly taking the position. By the second turn, Andretti swept back to reclaim the 3rd place position. The final restart was not completely without flaws. 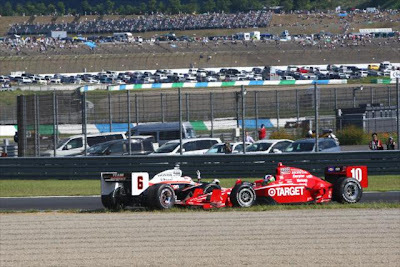 The KV Racing Technology cars driven by Takuma Sato and EJ Viso (both residing in the top-10 late in the Indy Japan) tangled in the first corner ending both of their top finishes. The #14 AJ Foyt Racing car of Vitor Meira would also have conflict in the final laps resulting in the Brazilian beached in the sand. Leading all but 1 lap, Scott Dixon's skillful piloting of the #9 Target Chip Ganassi Racing car on the Twin-Ring Motegi road course brought him his 25th IZOD INDYCAR Series win. 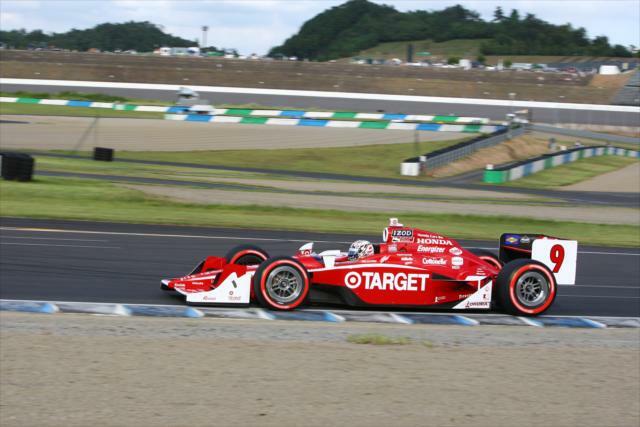 Taking his victory lap, Scott Dixon continued to drive around the track trying to locate the winner's circle at the Motegi road course event. As this Indy Japan: The Final concludes, Scott Dixon becomes the only driver to record a major race victory on both the road course and oval. Dixon won the 2009 event on the Twin-Ring Motegi track. With a second place run and Dario Franchitti's troubles in the Indy Japan race, Will Power gained the top place in the overall series points 11 markers ahead. Power also picks up the Mario Andretti Trophy for most points earned on IZOD INDYCAR road courses in 2011 for the second year in a row. Rounding out the top-five of the Indy Japan: The Final event on the Twin-Ring Motegi road course is Marco Andretti, Alex Tagliani and Oriol Servia. 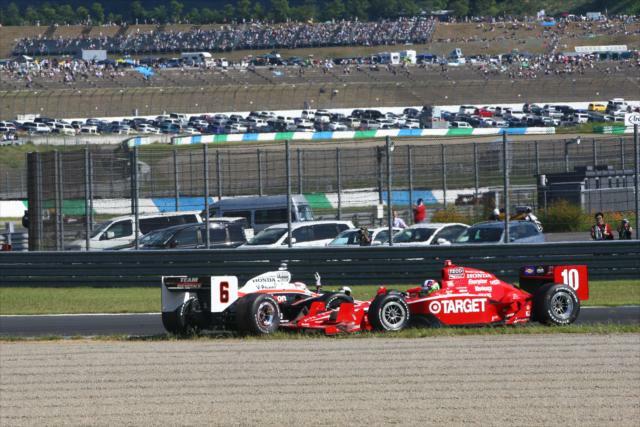 As the last Japanese round of the IZOD INDYCAR Series, the Twin-Ring Motegi event could be remembered for its relatively few passing opportunities or for the dominance of Scott Dixon. It could also be recognized as a race of conflict in the KV Racing Technology and Chip Ganassi Racing teams. However, as the 63-lap competition ran to its conclusion, this final INDYCAR event Japan demonstrates the country's people is looking forward to welcoming the world.